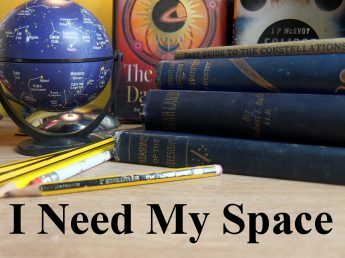 April | 2018 | I Need my Space! The clouds have been clinging to the Midlands like glue. I’m sick of them. 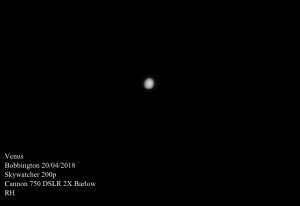 On Saturday I did manage to get another glimpse of Venus, and got an image, taken from the road to Albrighton. 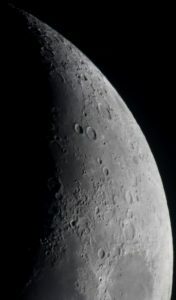 With only a small scope, it was difficult to focus, but the disc can be seen, as well as the partial phase. 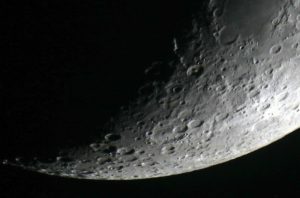 Hopefully I’ll get some more shots as it travels round the Sun, getting closer to Earth and showing a larger crescent. I used my SLR on my little Skywatcher Dob. 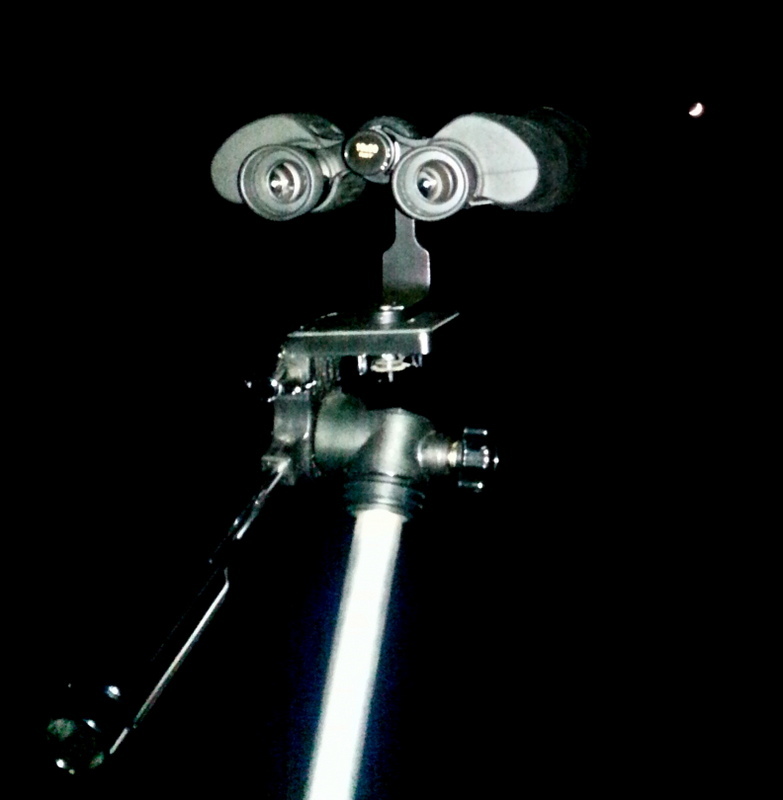 Not the most robust set-up, but very usable for ‘roadside astronomy’. I can set it up on the bonnet of the van. Talking about astro-gear, I’ve splashed out on some new binoculars. They’re Opticrom 10x50s and retail at £240. First Light Optics are selling them for £99, and I just couldn’t pass that up. My old 10x50s had been nocked out of line, so I had to buy some more. As usual, when you buy astro gear, it’s cloudy for weeks. I did manage a quick test between clouds over Tong, (a little lay-by observing site I sometimes use). I only had ten minutes before the clouds rolled in, but I managed views of M36 (Pinwheel Cluster), and M38 (The Starfish Cluster), The Beehive Cluster, the double cluster, and I think M51, but once I’d checked my sky atlas, the clouds had beat me to confirmation. Quite annoying, to only get a brief window when you’re dying to try out new gear. I’ve bought Steve Tonkin’s book on Binocular Astronomy too, and along with the Sky at Night ‘Binocular View’ feature, I’m looking forward to some good binocular astronomy over the summer. Lastly, some society pictures. I’ve been setting up a bookshop at our regular meetings, and it’s going really well. Less successful are our observing nights. We’ve had two group sessions so far, in five months. Damn clouds. 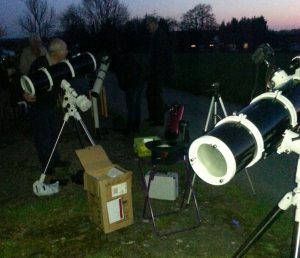 This is a special blog post for the people from Wolverhampton & Perton Library astronomy clubs on the ‘observation notification’ text list. It’s intended to give details about a new observation site in Bobbington, by Halfpenny Green airport. With only a few clear Tuesdays since November, WOLVAS club member Steve Hare and myself have been looking for alternative places around the same area that could be useable any day of the week. Last weekend we visited Farthingdales Camp Site, opposite Halfpenny Green Airport in Bobbington. The campsite owners have agreed to allow us use a portion of the campsite that is away from the security lights. We will also be able to use the (very clean!) campsite toilets. This new site isn’t meant as a replacement for Trysull, but rather an alternative semi-rural site that can be used on other days than Tuesdays. It’s very easy to find. Turn right at the Himley lights, if you’re coming from Wolverhampton, and stay on that road for 4.9 miles. This will take you past the Halfpenny Green Vineyard on your right, then Blakelands on your left. Not far after Blakelands you turn left into Crab Lane (signposted for the airport). After 0.4 miles, you’ll see the entrance to the campsite on your right, (see picture below). If you come across the entrance to the airport on your left, you’ve gone too far. The postcode given on-line is DY7 5DZ, but please note I haven’t tested this with my satnav. You have my mobile number in case you get lost. The observation site is just to the left. As you turn right off Crab Lane and enter the camp site, turn left then follow the single-track road bearing right. There’s places to park, (indicated by the P). We’ve agreed to pay £10 per session, as we’ll be using their land, and the facilities of the campsite. So however many of us turn up for a session, we’ll split the cost evenly between us. Steve and I agreed that even if only two people turn up, a fiver each is well worth it for access to a dark sky site with toilet facilities. There’s a very good low horizon to the north, south and west, but the east is less exposed, with tall trees obscuring some of the sky. There’s no access to electric like at Trysull, so I suggest bringing a flask for a warm drink. I’ve enabled ‘comments’ on this post, if anyone has any questions or comments, click the ‘leave a comment’ tab. Fingers crossed we get loads of clear skies!